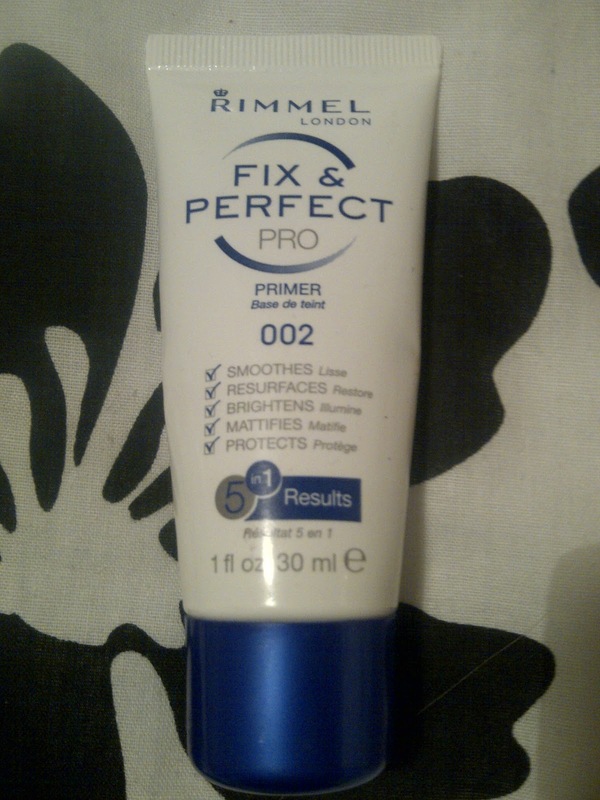 Meg's Boutique: Priming and Setting part 1: Rimmel fix and perfect pro primer. Priming and Setting part 1: Rimmel fix and perfect pro primer. Until recently I was only giving thought to the actual make up I was putting on my face and not thinking about what I was doing before and after applying it. However, many beauty blogs that I read put so much emphasis on priming and setting that I thought I should look into getting a primer and a setter myself to see if they can make as much difference to your make up as people claim. For primer, which is what you apply just before you put on your make up to allow easier application and better end results, I went for the Rimmel fix and perfect pro. I'll review the setter I went for tomorrow in part 2, as this post would be mega long if I reviewed both in one! I went for this primer because it was on offer on the Boots website for £4.99 rather than its usual price of £6.99 and was also the one that gave you the most product for money. When I was researching into primers I was a bit shocked at how expensive they are for how much product you get, for example No7's Airbrush away primer was £19.50 for only 30ml and all the primers were a lot more pricey than the foundations by the same brand. I've also found most of them aren't available in store (even the massive Sheffield Boots!) so you have to add on the postage and packaging cost on too. After the faff of having to order it online I was worried it would run out really quickly as it didn't seem like there was much product in the bottle, but thankfully over a month later it's still going strong! This is because I've found a little bit of this product goes a very long way and the tiniest blob manages to cover my whole face due to its nice light and thin consistency that spreads and blends easily. Now onto the actual results...Rimmel claims that it 'Smoothes, resurfaces, brightens, mattifies, protects and prolongs foundation wear' and I've got to say that it most certainly smoothes, resurfaces, mattifies and prolongs the wear of my foundation, as well as the rest of my make up and although it's harder to tell if it's brightening and protecting my skin, I do feel like it does those things too. I literally couldn't believe how much easier it was to apply my foundation after putting a thin layer of this on first and how much more matte and air brushed my face looked afterwards! It has also cleared up the slightly dry patches of skin that I had on my forehead where my foundation used to cake slightly, as it's really moisturising too. Plus, you can also wear it on those make up less days to give you a nice moisturised, bright and dewy look. So basically I am now in love with this primer and primer in general, can't recommend it enough and definitely don't intend to ever wear make up without it again! Although I might try out a couple of other primers when it runs out such as 17 photo flawless or the Body shop mattifying day cream which I've also heard good things about and don't break the bank either. Do you use a primer? What's your primer of choice? I hope you enjoyed the sunshine yesterday and are having a great Friday! I've been looking for a cheap primer for ages! thankyou for the review i might have to check this out! I happen to adore this primer. I have combination skin, and this does a great job of giving me an even texture. Fills in fine lines, too! It moisturizes the dry patches and gives a bit of mattifying effect to the oilier patches. It doesn't cause breakouts and it definitely extends my foundation's staying power. I've also worn it without any foundation and it helps to keep me from getting shiny for slightly longer. I've been debating trying a primer for a while but like you said they're always so pricey! I'm using a soap and glory foundation at the moment which has a built in primer and it's definitely the best foundation I've ever used. I'm very tempted to try a separate primer though.